Indexes ended lower on the day and for the week, as these two companies logged sharply negative stock-price swings. Tech stocks led the market sharply lower today. The Dow Jones Industrial Average (DJINDICES:^DJI) shed 212 points, or 1.3%, and the S&P 500 (SNPINDEX:^GSPC) lost 36 points, or 1.9%. The declines left both indexes in negative territory for the week, and down more than 7% since the start of 2016. In economic news, the monthly jobs report showed that payroll growth slowed to 151,000 in January from an average of 230,000 over the last three months. But the unemployment rate ticked down to 4.9%, an eight-year low. The report also included encouraging signs on wages, as average hourly pay rose by 2.5%, year over year. Unemployment rate. Source: Federal Reserve Economic Data. A few stocks made notable moves today, including networking giant LinkedIn (NYSE:LNKD.DL), and DVD-movie kiosk operator Outerwall (NASDAQ:OUTR). LinkedIn saw its stock cut nearly in half on more than 20 times its normal daily trading volume after the company posted surprisingly strong fourth-quarter results last night, with sales up 34%, to $862 million, and profit up 54%, to $0.94 per share. But its 2016 outlook on both the top and bottom lines came in well below consensus estimates. Management expects to see growth slowing to roughly 20%, down from last year's 35% pace, as its core talent-solutions business cools off. In contrast, consensus estimates had been calling for just a minor slowdown, to 30%. In absolute numbers, LinkedIn expects $3.6 billion of sales this year, far from the $3.9 billion that Wall Street was targeting . The same downbeat outlook applied to profits, where the company guided to $3.13 per share, representing just an 8% improvement over last year's result. Analysts were expecting closer to $3.67 per share of earnings this year. 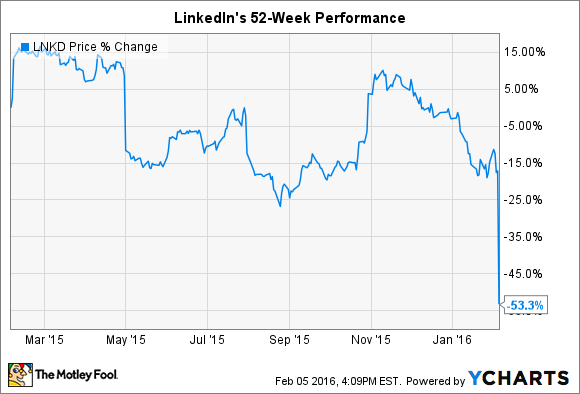 LinkedIn's profitability should drop to 27% from 29% last year, Weiner forecast. With sales growth, net income growth, and profitability all projected to slow substantially, it's no surprise that investors took a step back from the stock today. Outerwall fell 19% after posting fourth-quarter earnings that failed to meet Wall Street expectations. Revenue slumped by double digits as the number of DVD movie rentals in its core Redbox business plummeted by 24%. In a press release, Outerwall's management said the dive was powered by several unfavorable trends, including a stampede toward digital consumption, weaker new-release content, and economic sensitivity around its latest price increase. As a result, even though average revenue per rental increased, overall profitability fell by 50%, and Redbox's operating margin slumped to 15% from 26% a year ago. Management said that the division, which accounts for 80% of its sales, remains valuable despite those huge declines. "We will manage the business for profitability and cash flow, and we will continue our focus on expense management, operational efficiencies and network optimization," CEO Erik Prusch said in a press release. However, executives described the drop in DVD rental demand as "accelerating," and said that slump makes it too difficult to forecast 2016 revenue for the time being. Outerwall issued a huge guidance range for profit though -- somewhere between $5 per share and $6.30 per share. Wall Street was expecting the kiosk operator to generate $7.14 per share, instead.